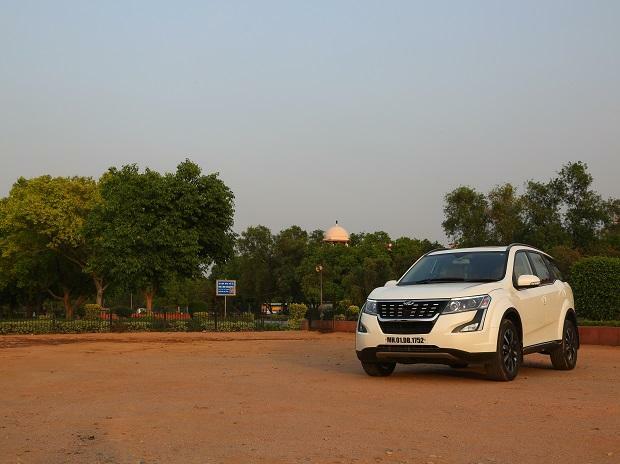 The Mahindra XUV5OO was always been a chunky, good-looking vehicle. With a facelift, the Plush New XUV500 has retained its handsome looks and now comes with smart changes on the aesthetics front. The exterior changes are quite evident with the new front grille with chrome inserts, new daytime running lights (DRLs), projector headlamps and attractive fog-lamp bezels. The vehicle now sits on bigger 235/60 R18 tubeless tyres cast on diamond-cut alloys. The side profile gets smarter with stylish side cladding at the bottom with chrome lining. The changes in the rear include a newly designed tailgate which is a lot flatter than the curvy one in the predecessor, new split tail-lamps and twin exhausts. It’s in the cabin area that you notice the plushness of the vehicle. The tan leather seats give the vehicle a premium look. While the second row seats can be folded 60:40, the third row seats can be folded 50:50. The centre console area now has a new piano black finish which definitely adds to the upmarket feel of the dash area. The dashboard and door trims now have a soft-touch, faux leather material with fine stitch lines. The vehicle comes with an electric sunroof with anti-pinch. The driver’s seat is 6-way power-adjustable. 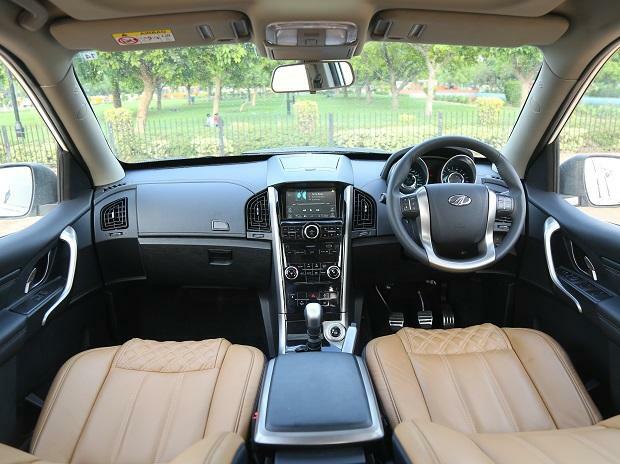 For entertainment, the XUV has an 18cm touchscreen infotainment system. Clubbed with an advanced Arkamys sound system, it ensures a decent acoustic experience. The W11(O) model I drove is an all-wheel drive vehicle. 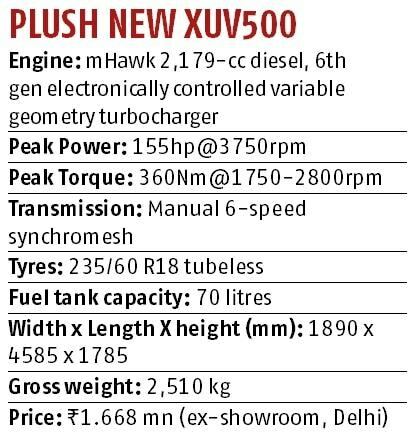 The driving dynamics of the vehicle has really not changed in the new Plush New XUV 5OO. Though the power and torque have been marginally pushed up, the vehicle is just a wee bit faster than its predecessor. The ride and handling too continue to be decent and despite the massive girth and height of the vehicle, body roll is well under control. And with discs on all four wheels, braking is a lot prompt and definite. The car is loaded with several safety features. It is the comfort quotient of the vehicle that has really skyrocketed, while driving dynamics remain top-notch.